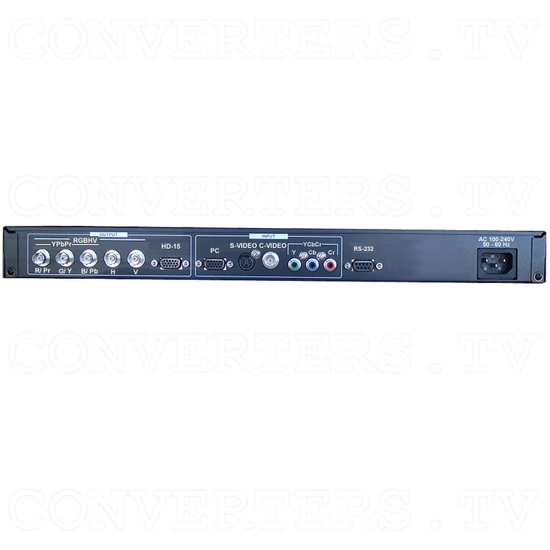 High-performance professional video scaler, converting composite, S-video and YCbCr component video into high resolution computer and HDTV resolutions. Output is available in VGA, SVGA, XGA, SXGA, WXGA, 1365x768, 720p or 1080i resolutions in RGBHV format and as 480p or 576p in YPbPr format. 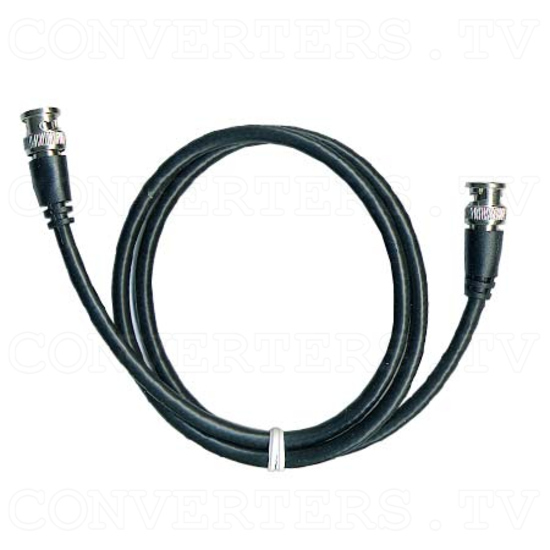 The output signal can be routed to either an HD-15 or 5 BNC connectors. It is ideally suited for use with LCD Projectors, CRT Monitors, Projection TV Systems, Plasma or HDTV Displays to improve picture quality. Adjustments are provided for Color, Hue, Brightness, Contrast and Sharpness. This unit is also equipped with a computer signal pass-through feature that can accommodate RGBHV or YPbPr formats. CSC-1600HD's Adaptive Film Mode is an automatic 3:2 pull-down detector that provides clear and crisp de-interlacing video from 24 fps film, which offers significant enhancements when viewing movies on a large screen. A Vertical Temporal Filter removes jagged edges and other de-interlacing artifacts for video motion sequences. Superior motion compensation circuitry insures a smooth presentation of fast moving images. The unit automatically detects a wide variety of NTSC, PAL and SECAM input standards. The CSC-1600HD can be controlled from the front panel, via its Infrared Remote Control or by RS-232. The Navigation Menu is shown via an OSD (On-Screen Display) to facilitate operational control. The OSD may be disabled when desired, such as during live events. The front panel buttons may locked out to prevent accidental or unauthorized to the controls. 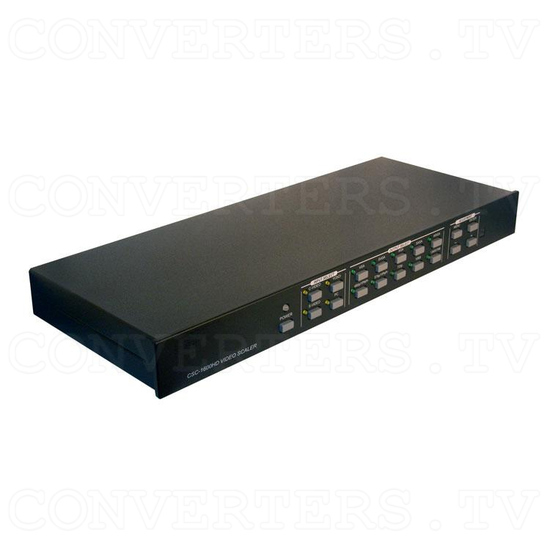 It is available in Desktop and Rackmount versions. 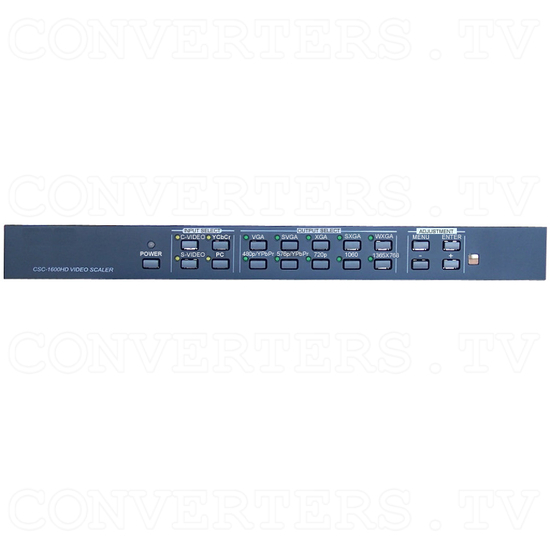 High-performance professional video scaler, converting composite, S-video and YCbCr component video into high resolution computer and HDTV resolutions. Output is available in VGA, SVGA, XGA, SXGA, WXGA, 1365x768, 720p or 1080i resolutions in RGBHV format and as 480p or 576p in YPbPr format. 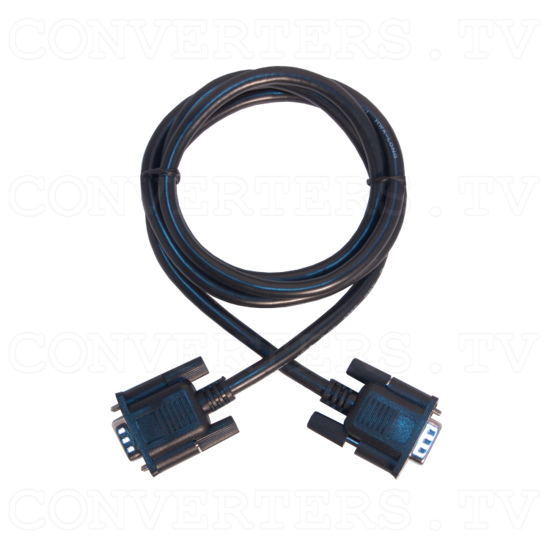 The output signal can be routed to either an HD-15 or 5 BNC connectors. It is ideally suited for use with LCD Projectors, CRT Monitors, Projection TV Systems, Plasma or HDTV Displays to improve picture quality. Adjustments are provided for Color, Hue, Brightness, Contrast and Sharpness. This unit is also equipped with a computer signal pass-through feature that can accommodate RGBHV or YPbPr formats. CSC-1600HD's Adaptive Film Mode is an automatic 3:2 pull-down detector that provides clear and crisp de-interlacing video from 24 fps film, which offers significant enhancements when viewing movies on a large screen. A Vertical Temporal Filter removes jagged edges and other de-interlacing artifacts for video motion sequences. Superior motion compensation circuitry insures a smooth presentation of fast moving images. The unit automatically detects a wide variety of NTSC, PAL and SECAM input standards. The CSC-1600HD can be controlled from the front panel, via its Infrared Remote Control or by RS-232. The Navigation Menu is shown via an OSD (On-Screen Display) to facilitate operational control. The OSD may be disabled when desired, such as during live events. The front panel buttons may locked out to prevent accidental or unauthorized to the controls. It is available in Desktop and Rackmount versions. Auto Detect - Automatically recognises and configures for incoming worldwide television standards (NTSC 3.58, NTSC 4.43, PAL, PAL M, PAL N, SECAM). 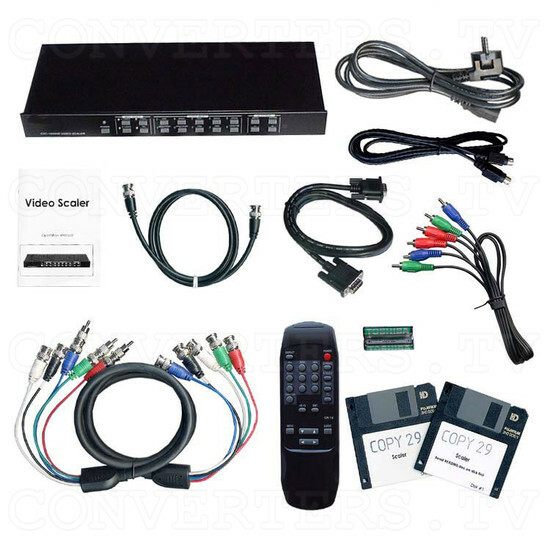 Direct Video Input Selection - Composite, S-Video, YCbCr Component Video and PC/HDTV Bypass. Video Processing Amplifier - Adjustment for Brightness, Contrast, Chroma, Hue and Sharpness. Configuration Memory - Each of the three video imputs has its own non-volatile memory to retain settings. Direct Output Resolution Selection - Each of the eight output resolutions has its own Front Panel Button. 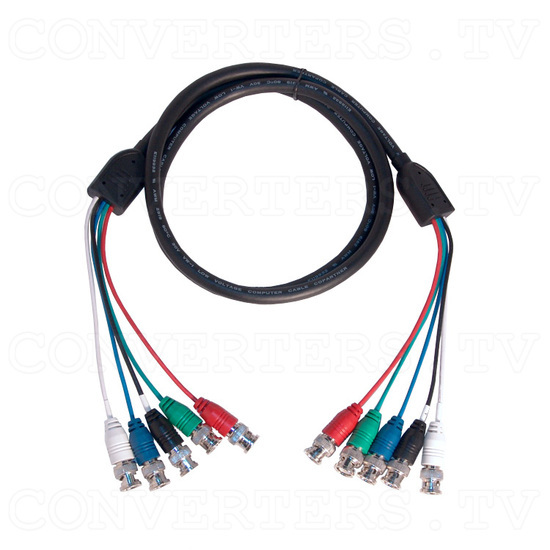 Choice of Output Connectors - Choose from sending the output signal to either an HD-15 or 5 BNC's. 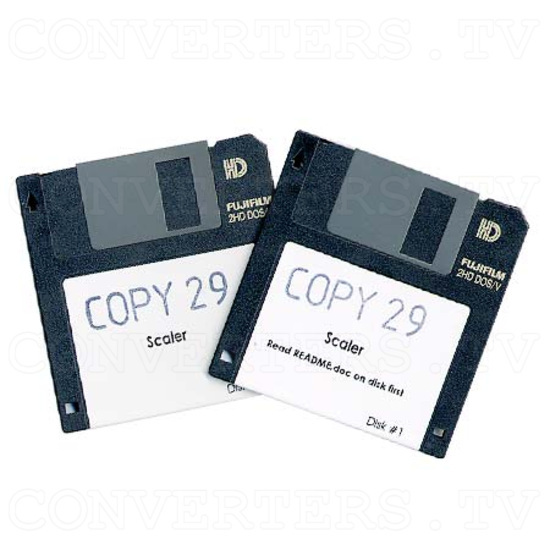 Two Output Formats - 480p and 576p in YPbPr and all other resolutions in RGBHV. OSD (On-Screen Display) - Provides ease of Menu Navigation for setup and adjustment. RS-232 Interface - Facilitates control of all functions and adjustments by external devices. 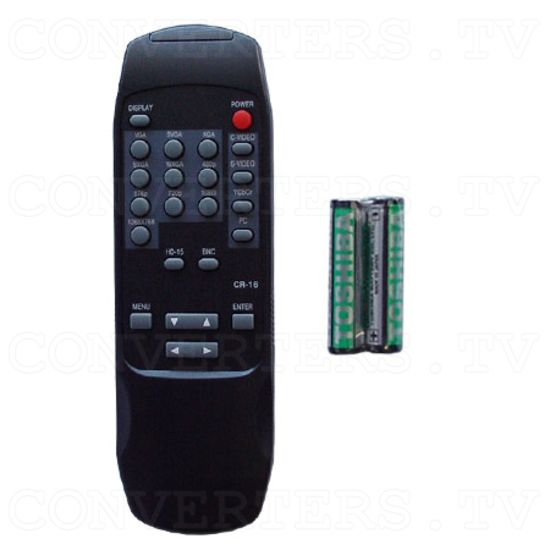 Infrared Remote Control - Use the full-functino IR Remote to control all functions and adjustments. Flexible housings - Choose from Desktop or Rackmount configurations by exchanging the front plate. Universal Power Supply - Internal Power Supply operates in virtually all countries worldwide. 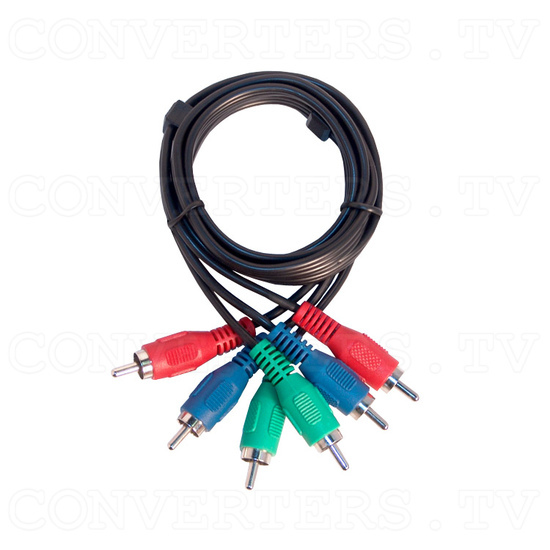 Input: 1x Composite Video via BNC jack, 1x S-Video via 4-pin mini-din female, 1x YCbCr via 3 RCA connectors, 1x VGA loopthrough 15-pin D-sub connector. Output: Menu selectable, 1x via HD-15 female connectors, 1x via 5x BNC connectors. 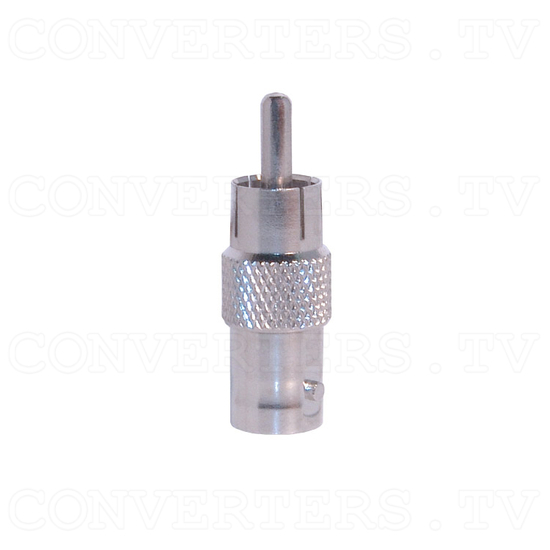 Control: 1x RS-232 9-pin connector. 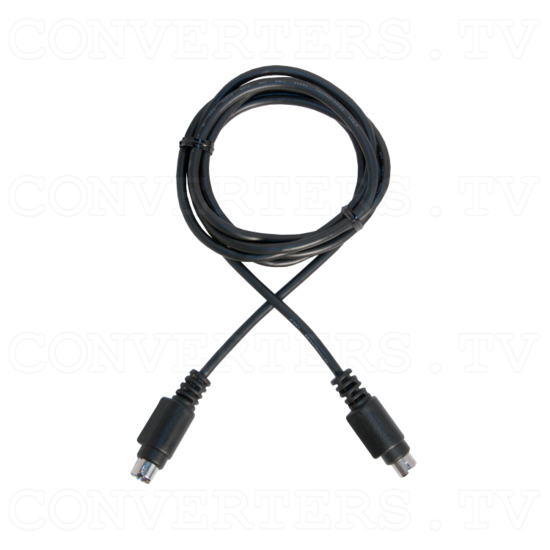 Accessories: 1x Ac adaptor, 1x video cable, 1x HD-15F to HD-15F cable, 1x AC power line, 1x S-Video cable.